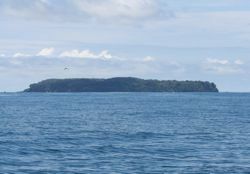 Isla del Caño – Cano Island became a Biological Reserve in 1978, helping to preserve an important part of the natural and indigenous history of Costa Rica. The Island lies 17 km. due west of Marenco on the Pacific Ocean, in front of the Corcovado National Park, in the Osa Peninsula. The island originated between 40 and 50 million years ago, as a result of the movement of tectonic plates, when the Cocos’ plate sunk under the Caribbean plate causing its emergence. During pre-colombian times this place used to be an Indian cemetery. Excavations have revealed rests of pottery, carved stone artifacts, and the stone spheres typical to the Osa Peninsula area. Other interesting findings have led archaeologists to believe that indigenous cultures used the island as a key trading point along the Pacific Coast. 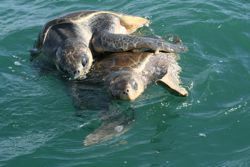 >> Join us to discover Costa Rica’s best snorkeling spot! Cano Island attracts visitors to its beaches, coral beds, sea life and migratory birds. Famous for having Costa Rica’s largest concentration of coral-building organisms along the Pacific Ocean, Cano Island Biological Reserve plays host to schools of tangs, jacks and needlefish, boring sponges, diadem sea urchins, sea cucumbers, crustaceans, parrot fish, puffers, damselfish, large schools of barracudas, tunas, and moray eels that present an ever-changing panorama to those who venture below the surface for some of the best snorkeling and scuba diving in Costa Rica. Snorkelers and divers spend hours below the oceans surface investigating the variety of life found among the Porites and Pocillopora coral reefs. Marine life is also abundant in the general outliers of the island. Manta rays are often seen breaching, dolphins are encountered daily, and Olive Ridley sea turtles are commonly observed swimming and even mating as they travel to and from the sandy beaches of the peninsula where they lay their eggs. Also spotted are the white tipped reef sharks, silky sharks, bull sharks and occasionally whales sharks and humpback whales, which are seen during their annual migrations from July and October, and again in December through March. Cano Island is composed of Tropical Rain Forest and its vegetation is varied, presenting very high trees and evergreen flora. It contains almost 158 species of superior plants and ferns. The island’s forest and its inhabitants are in stark contrast to those on the mainland of Corcovado National Park, less than 11 miles away. The island has a resident insect fauna that is perhaps one percent as rich as that of Corcovado.